A real-time data and digital content provider FeedConstruct was released in spring 2018 and has gone considerably far. As a result of continuous success of the past year, FeedConstruct gathered an exclusive charge of sports data solutions, becoming a part of the leading cornerstone of the international gaming industry - ICE 2019. On the grounds of our hard work are perceivable figures such as 40,000 live events instead of 30,000 for Odds Feed, 65,000 pre-match events instead of the previous 55,000 and Esport. During the past year, we obtained a number of exclusive contracts worldwide and well-known Sambo, PSA, Armenian Basketball A & B leagues, ABA League Basketball, Armenian Football Premier League, are now our unique partners. Besides, on 2018 our Statistics has added new data types for top football leagues: injuries and player’s statistics on played minutes, the number of played games, assists, yellow/red cards, goalkeeper saves, as well as 150 new competitions coverage. A new Stats application for iOS and widgets solution for H2H and Team overview has been introduced. Our Live Scouting service has recorded a number of achievements and the best one is the trust of our partners. “2018 has been very productive for us. Being awarded as the Sports Innovation of the year, we presented the innovative Friendship platform and the revolutionary AJNA, which are here to transform the sports data market. 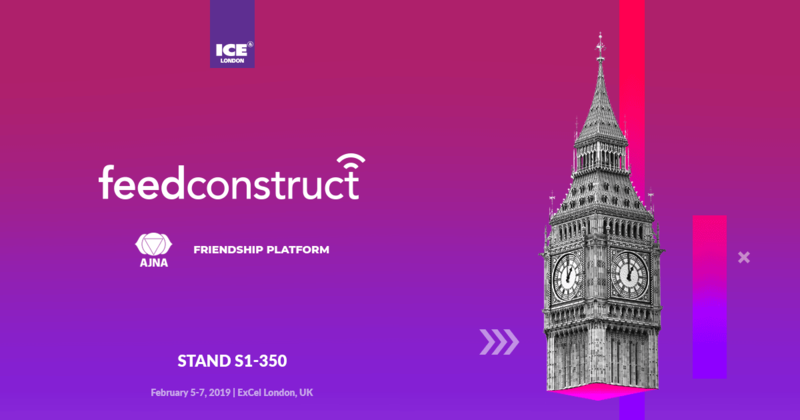 Their full potential will be shown this year at ICE 2019, which we believe is the best way to give a start to success.” says George Arabatlian, Head of FeedConstruct. With forward-thinking addresses, FeedConstruct has shared its knowledge in the sphere of machine learning, which is a core aspect of what's currently defined as artificial intelligence. First time unveiled in October 2018, AJNA leads the industry to the new market potentials. Having a video frame captured, transformed and sent to the tracking system, AJNA performs field geometry auto detection, identifies field scheme and corners, players and ball. Boasting solutions for the next-generation business development, our Stand S1-350 invites all the visitors seeking greater freedom of product choice and flexibility.